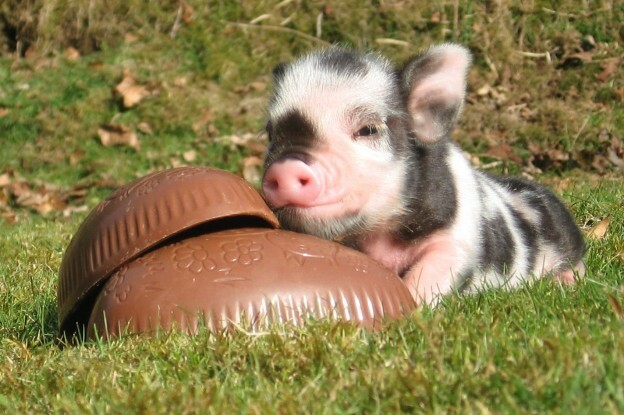 School’s out and we have plenty of Pennywell Farm fun to keep you busy over the Easter holidays. You can meet all the spring lambs, goat kids and pet babies as well as enjoying plenty of piggy cuddles with the world famous Pennywell Miniature Pigs. On Good Friday, arrive early and enjoy a FREE hot cross bun with every hot drink purchased before 11am. That should set you up for a full day of Pennywell fun, including hands on activities, rides and displays and the chance to unleash your inner animal when Poco Drom performs his animal songs in the Pennywell theatre. Giant Easter Egg hunts on Easter Saturday, Sunday and Monday will satisfy the chocoholics amongst you but there is so much more going on over the two week school holiday. Easter activities like egg rolling, egg tossing and guess the weight of the Easter bunny will be added to your favourites and we will of course be bottle feeding the Pennywell lambs and goat kids as well as enjoying the fabulous Pennywell Miniature Pig racing every afternoon at 2.30pm. There is extra special entertainment every day during Devon school holidays from Elfic the Jester, Matt Pang and Mr Phil. Catch our entertainers in the theatre every day at 1pm and 3pm. Make the most of the Easter holidays and enjoy a full day of fun on the farm. The great bonus is that if it rains at any point during your visit, we will give you a FREE return ticket so you don’t miss out on a single thing! The only optional extra is a pony ride at £3.50 and there are some coin op rides. All the activities, entertainment and farm rides are included in the admission price. is penny well farm open tomorrow morning yes or no? Yes, open every day from 10am to 5pm. Hi are well behaved dogs on leads allowed please? We don’t allow dogs into the farm itself but we do have kennels available in our car park for visitors dogs. You are able to go in and out of the farm as many times as you like to check on them. All you need to do is bring a bed and a water bowl. What time is Poco Drom on? So sorry for the delay. He’s performing at 1pm and 3pm. Please can you tell me when Mark is working as farmer for the day? He’s the kids’ favourite! He’s our Activity Farmer on Tuesday and Thursday this week.